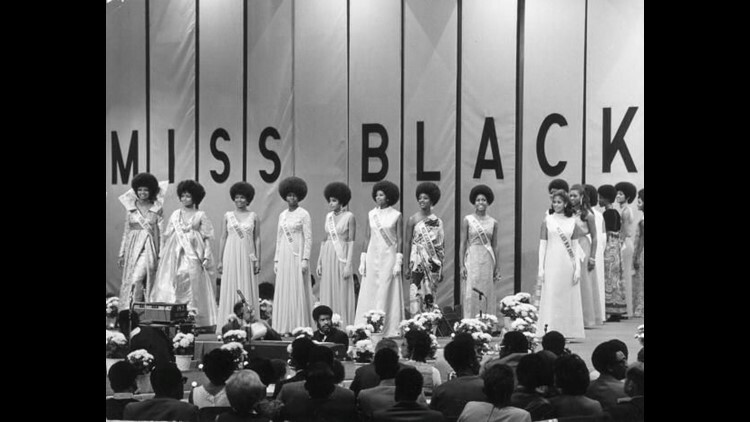 Contestants for the Miss Black America pageant line up on stage in front of a panel of judges during the evening gown competition in the early 1970s. The Miss Black America pageant is not to be regarded as a black Miss America pageant. Since its founding in 1968, the organization has forged its own path – with its own syndicated television network – to proudly celebrate the beauty, talent and intelligence of black women, long excluded from mainstream pageants. In recent years, the pageant’s “rebirth” aims to rekindle its protest roots to address ongoing disparities in perceptions and treatment of minorities, said founder J. Morris Anderson. “We are really concentrating on some of these problems that existed for black people in the 1960s and still exist today,” Anderson said. “We are aware that there’s an absolute need for this pageant to continue." This weekend’s Miss Black America pageant at the Gem Theatre in Kansas City will mark nearly 50 years since the inaugural production, held in Atlantic City on Sept. 7 hours after the Miss America pageant — and its protests — ended nearby. “The truth is that, in staging the pageant on the same night and down the street from Miss America, we thought we would get a lot of leftover press,” said Anderson. Anderson’s two young daughters dreamed of becoming Miss America, he said, but didn’t understand the reality of the time. The Miss America pageant required all women be “of good health and of the white race” until 1940, when rules changed to allow women of color to compete. Even so, by the late 1960s there had never been a black contestant. So at age 32, Anderson organized the first Miss Black America pageant with them in mind. The first Miss Black America was Philadelphia college student Saundra Williams, who performed a traditional African dance and stated her belief that men should contribute more to their households. She also used the platform to call out historical exclusion of black women from Miss America. The Miss Black America pageant quickly gained popularity and was televised nationally starting in 1969, the same year Curtis Mayfield wrote and sang its theme song. Williams, the 1968 winner, will not be at the pageant Saturday. More than 50 women will compete for the title of Miss Black America. Previous winners include media mogul Oprah Winfrey, singer Toni Braxton, actress Bern Nadette Stanis, and gymnast Nicole Hibbert. This year’s contestants attended receptions and rehearsals this week in Kansas City in preparation for Saturday’s show. The women will be judged in swimsuit, talent and projection categories. Shortly after, the Kansas City Star published an editorial calling for Miss Black America to follow suit. “Simply forsaking the swimsuit competition could bring the event in line with the times and propel the organization to its next half-century celebrating smart, strong women of color,” the editorial board wrote. Aleta Anderson, the pageant’s executive director, disagrees. New programming does include a heightened focus on discussing issues facing African Americans, such as mass incarceration, said the pageant founder, who is now 82.